No longer a jumped-up Canberra or, worse, Sacramento, it seems about to emerge as Pyongyang on the Potomac, the undisputed center of national power and influence. As a new president takes over the White House, the United States' capacity for centralization has arguably never been greater. But it's neither Barack Obama's charm nor his intentions that are driving the centrifocal process that's concentrating authority in the capital city. It's the unprecedented collapse of rival centers of power. This is most obvious in economic affairs, an area in which the nation's great regions have previously enjoyed significant autonomy. But already the dukes of Wall Street and Detroit have submitted their papers to Washington for vassalage. Soon many other industries, from high-tech to agriculture and energy, will become subject to a Kremlin full of special czars. Even the most haughty boyar may have to genuflect to official orthodoxy on everything from social equity to sanctioned science. At the same time, the notion of decentralized political power – the linchpin of federalism – is unraveling. Today, once proudly independent – even defiant – states, counties and cities sit on the verge of insolvency. New York and California, two megastates, face record deficits. From California to the Carolinas, local potentates with no power to print their own money will be forced to kiss Washington's ring. Americans may still possess what the 19th-century historian Frederick Jackson Turner described as "an antipathy to control," but lately, they seem willing to submit themselves to an unprecedented dose of it. A financial collapse driven by unrestrained private excess – falling, ironically, on the supposedly anti-Washington Republicans' watch – seems to have transformed federal government cooking into the new comfort food. To foreigners, this concentration of power might seem the quintessence of normalcy. As the sociologist E. Digby Baltzell wrote in 1964, elites have dominated and shaped the world's great cosmopolitan centers – from Athens to Rome to Baghdad – throughout history. In modern times, capital cities such as London, Paris, Moscow, Berlin and Tokyo have not only ruled their countries but have also largely defined them. In all these countries (with the exception of Germany, which was divided during the Cold War), publishing, media, the arts and corporate and political power are all concentrated in the same place. Paris is the undisputed global face of France just as London is of Great Britain or Tokyo is of Japan. Although each had their merchant classes, these cities were strongly hierarchical, governed by those closest by blood or affiliation to the ruling family and populated largely by their servants. In contrast, Baltzell observed, U.S. cities such as New York have been "heterogeneous from top to bottom." Their power came not from the government or the church but from trade, the production of goods and scientific innovations, as well as the peddling of ideas and culture. But Washington has always occupied a unique and somewhat incongruous niche among U.S. cities. It came into being not because of the economic logic of its location, but because it was a convenient compromise between North and South. It never developed into a center of commerce or manufacturing. Nor was it meant to be a fortress. Instead, it was designed for one specific purpose: to house the business of governance. Pierre Charles L'Enfant, the French-born classicist and civil engineer who developed the plan for the city, envisioned a majestic capital that would "leave to posterity a grand idea of the patriotic interest," as he wrote in 1791. 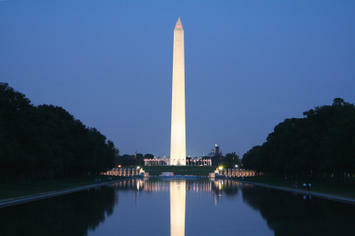 Yet for most of its history, Washington failed to measure up to the standards of European or Asian capitals. In January 1815, a South Carolina congressman described the capital to his wife as a "city which so many are willing to come to and all so anxious to leave." This lowly status stemmed, to some extent, from what the historian James Sterling Young has defined as the "anti-power" ethos of early Americans. The revolutionary generation and its successors loathed the confluence of power and wealth that defined 19th-century London or Paris. A muddy outpost in the woods seemed more appropriate to republican ideals. Even as other American cities, such as New York and Baltimore, expanded rapidly, Washington grew slowly, at a rate well below the national average. Bold predictions that the city would boast a population of 160,000 by the 1830s fell far short. Instead, it had barely reached 45,000 people, including more than 6,000 slaves. It remained eerily bereft of all the things that make cities vital – thriving commerce, a busy port, decent eateries and distinguished shops. Visiting the city in 1842, Charles Dickens marveled at a city of "spacious avenues that begin in nothing and lead nowhere." To some observers, such as Alexis de Tocqueville, Washington's relative decrepitude reflected one of the glories of the young republic. The fact that the country had "no metropolis" that dominated it from the center struck the young noble, on his visit to America in the early 1830s, as "one of the first causes of the maintenance of Republican institutions." Washington's status improved only marginally in the next century, even as other brilliant centers of power, culture and commerce emerged on the Eastern Seaboard and then across the Midwest and West. The rapid rise of New York was challenged in quick succession by the even more sudden emergence of Chicago in the industrial Midwest and San Francisco on the Gold Rush coast of California. Washington was surely the nerve center of politics, but commerce, culture and the vast majority of the media chose to concentrate elsewhere. It would take enormous misfortune – the Depression – to provide Washington with its first great growth spurt. As the business empires of New York, Chicago, Detroit and Cleveland buckled and the New Deal took control of the economy, power shifted decisively to the capital. This expansion of influence continued with the onset of World War II and then during the Cold War. The ensuing rise of the military and domestic bureaucracies transformed Washington from a small provincial city into a major metropolitan area. The greater economic shift from a predominantly manufacturing to a high-tech, information-centered economy also played to Washington's strengths. In his groundbreaking 1973 book The Coming of Post-Industrial Society, the sociologist Daniel Bell predicted that the country's prevailing "business civilization" would inevitably become dominated by the government bureaucracy. Corporations would eventually look to Washington's lead for regulatory standards, to sponsor research and make critical science-related decisions. In the past half-century, this confluence of technology and bureaucracy has transformed Washington and its surrounding suburbs into the most dynamic large metropolitan economy in the Northeast. Between 1950 and 1996, the region's population expanded by roughly 150 percent, three or more times faster than other cities along the Boston-Washington corridor. By the mid-1970s, Washington and its environs had also emerged as the richest region in the country. Since then, it has remained at or near the top of metropolitan areas in terms of both per capita income and level of education. Despite deplorable concentrations of poverty, particularly in the city proper, the region's average household incomes remain the highest in the country – nearly 50 percent above the national average. The percentage of adults with a bachelor's degree or higher, nearly 42 percent, surpasses even such brainy-seeming places as greater Boston, Seattle and Minneapolis. The contrast between Washington and most of the United States has gradually become more pronounced. In good times and in bad, lawyers, lobbyists and other government retainers have continued to enrich themselves even as the Midwest industrial-belt cities have cratered and most others struggled to survive. "The vision of generations of liberals," admitted the New Republic in the mid-1970s, "has created a prosperous and preposterous city whose population is completely isolated from the people they represent and immune from the problems they are supposed to solve." In today's crisis, the Washington area remains somewhat aloof, with the second-lowest unemployment rate among major metropolitan areas of more than 1 million. (Only Oklahoma City, largely insulated from both the financial and housing bubbles, is doing better, although collapsing energy prices could threaten its prosperity.) The rate of job growth, although slower, is still among the highest in the country, and unemployment is below the national average. This disparity will grow in the coming years, as rival regions reel from the recession. Many once-powerful places are already losing their independence and allure. Wall Street, formerly the seat of privatized power, has been reduced to supplicant status. The fate of New York Mayor Michael Bloomberg's "luxury city" will be determined not in deals with London, Dubai or Shanghai but by the U.S. Treasury. Similarly, the vast auto economy of the upper Midwest will take direction from congressional appropriations and whoever is named the new "car czar." This loss of power in the provinces will broaden in scope during the coming months. Even proud Texas has lost its unique political influence. Its energy barons will now be forced to do the bidding of the lawmakers and regulators, instead of carrying them in their hip pockets. Even industries that are well plugged in to the new Obama regime – such as venture capital and alternative energy – are facing financial ruin from the downturn in both markets and energy prices. To win new funding and subsidies for their next bubble, they'll increasingly rely not on their ballyhooed cleverness but on their pull with the White House, Congress and the new science apparat, under the green-oriented Energy Secretary Steven Chu and Obama's neo-Malthusian pick for White House science adviser, physicist John Holdren. All this is bad news for much of America, but it should mean great business for many residents of greater Washington. Sudden interest in District pied-a-terres among investment bankers, venture capitalists, energy potentates and their hired help could do a lot to restore the battered condominium market. Office buildings in the District and surrounding environs can now expect a new rush of tenants, both from the private sector and the soon-to-be expanding federal bureaucracies. The transfer of cultural power to Washington will also accelerate. After all, Washington is more than ever where the action is. Media outlets have already been shifting out of New York and other cities – the Atlantic Monthly moved from Boston to Washington in recent years, and USA Today, National Public Radio and XM Radio are headquartered in or near the capital. A city that, according to one 19th-century account, had a cuisine consisting largely of "hog and hominy grits" now boasts world-class restaurants, draws top-line chefs to its food scene and will continue to develop into a serious epicurean center. The area already ranks third in film and television production, largely because of a thriving news and documentary business, as embodied in National Geographic, the Public Broadcasting Service and the Discovery Channel. Over time, those of us in the provinces may grow to resent all this, seeing in Washington's ascendancy something obtrusive, oppressive and contrary to the national ethos. But don't expect Washingtonians to care much. They'll be too busy running the country, when not chortling all the way to the bank. This article originally appeared at the Washington Post. Submitted by robert1122 on Sat, 07/13/2013 - 06:15. Submitted by robert1122 on Thu, 07/11/2013 - 06:54. Submitted by RodneyK on Wed, 04/15/2009 - 02:03. The positive mood of the article somehow develops the sense of optimism. In human emotional study, no matter how heavy the predicament you are carrying, as long as you accept it constructively, you'll never consider it as is. This concept is very useful in times of crisis. Short term credit is a thing we all need at one time or another. One of the most widespread forms of short term credit is payday loans. Well, they are no stranger to controversy, and a lot of state legislatures are trying to find if or what ways they can shore them in. Right now, Congress has sent a payday loan reform act to a House Committee to mull over just what they want to do with it, like eliminating rollovers and prohibiting loans from multiple lenders to the same customer. If its reform for health rather than reactionary bans to help out their banking buddies, then a cash advance rule from Congress on short term credit may not be so bad. Submitted by TE on Wed, 01/28/2009 - 09:51. Submitted by JohnR on Tue, 01/27/2009 - 11:54. 2. We have great need for infrastructure and energy investment. 3. We have a need to improve education. 1. Allow me to start with education. The failure of education is mostly about a failure of future vision. Children are by nature all about the moment. It is the exceptional child and family that see that success has always come thru education. Most children have but a vague view of their completing high school, and going to college. This is the pivotal point. We must promise children and show them their future is secure thru education if they meet educational goals, John Sununu once said he could teach any child that wanted to learn with a slate and chalk. He knew no answer for the un-motivated child. Our challenge is how to engage the 20-30% of our children that have no vision of their future or the consequences of failure. We must reach and incentivize by creating free education for those who reach certain education milestones. We must improve or create a vast vocational training network for those that don't. You own a home I assume. As long as you own that home you support the local k-12 system and it’s important to note that even after your own children pass thru this system you continue to pay. We must view secondary education in the same light. We must create a payroll tax to pay for free secondary education of vo-tech training. Using tax anticipation bonds you fund tuition to any college in America the child can attain. The hook for the children is 2 fold: 1) you will get a free education, 2) you better strive for it because you are going to pay for it the rest of your working life. The families of the working class will be freed of the burden of college. (This could free billions in 529 and pre-paid college funds for consumption or investment or perhaps a free one time Roth creation. The families will know their children are secure and hopefully invest time in assuring their child strives. The benefit is a reversal of transfer payments to older payments to invest in our children who are our future. Some children still won't get it but the knowledge is there that no matter what job they end up with that THEIR children's education will be taken care of. Current people with student loans will be comforted with the knowledge of their children's security. 2 and 3. Tax and spend doesn’t work. Tax and invest will. We must create an American sovereign wealth fund. We must look at energy, roads and bridges and power infrastructure as investment opportunities that will pay back to the government thru profits and fees. We must look at our strategic oil reserve as the start of an energy bank. We need to support the price of oil strategically to incentivize green energy and oil exploration. We also need to look at energy as a golden opportunity to make vast fortunes for the wealth fund thru partnering and venture capital like business models. The key is to run investment as a business would, to maximize returns for the wealth fund. The investment capital would come thru 4 sources, the strategic oil reserves, the social security tax, tax anticipation bonds and the gold in Fort Knox. We need a paradigm shift in thinking here. The business of America is business. The future of government is to become 2 parts, one that uses tax revenues to do the things that have no tangible return i.e. military, police, judicial, poverty, etc. and the other is to invest in the American people – in their future and for their future. Warren Buffet has taken a beating this year, but he is and will be shown ultimately right that the long view is correct. We will recover, we always have, but right now at this time we have an opportunity to invest and correct for future problems with assets that can be created at fire-sale prices. Social Security can be made solvent by recognizing and annuitizing future costs and using the profits of the wealth fund to build the wealth of Americans thru their receipt of tax free dividends from the profits of the wealth fund. This is incomplete and probably way too simplistic, but it is my idea for you to ponder. Submitted by kenstremsky on Tue, 01/27/2009 - 13:09. I am very glad you care about education. If our country decides to have a payroll tax to pay for free secondary education or vo-tech training , businesses should NOT have to match employee contributions. If businesses have to match employee contributions, expect higher unemployment, lower wages, and more inflation. A payroll tax for education could be placed on all wages a person makes in a year. Our country could have a 2 percent national sales tax placed on most items other than food, shelter, health care, and education and have some of the money from the national sales tax be used to help fund education, Social Security, and Medicare. If a national sales tax is adopted, the federal income tax on individuals and businesses should be reduced. Businesses need capital to stay in business. The federal government and state governments should stop taxing interest from savings accounts, dividends, capital gains, and estates. Businesses especially small businesses may have an easier time obtaining loans and investments for hiring workers, research and development, and plant and equipment. We should have real competition in our k-12 schools if we want poor children and other children to do better in life. Amendment One of the United States Constitution says "free exercise" of religion. We should allow parents to use vouchers to send their children to private k-12 schools including private k-12 religious schools. Vouchers may allow many more small schools to be created and reduce poverty over time. People want competition in gas stations, retail stores, and restaurants. They should want real competition in k-12 schools. Do they care more about children or restaurants? Our country needs to get very serious about reducing functional illiteracy dealing with reading and writing. I have known about how big a problem functional illiteracy is for our country for more than 23 years. If our country wants to reduce poverty over time, we need to tackle functional illiteracy the way that we did World War 2. People may have a hard time getting decent paying jobs if they have trouble reading and writing. The federal government, state governments, and businesses should help fund and run free education websites that have top teachers and top students using many different languages via video, audio, notes, and other things to teach k-12 subjects, college subjects, and graduate school subjects. Teachers and students could be compensated. The more languages our citizens know well the more money they may make. Homeschooled students and poor students may especially benefit if they are able to use computers in libraries. The federal government, state governments, and businesses should spend a lot more money on free during the school day tutoring, free after school tutoring, and free weekend tutoring. The federal government, state governments, and businesses should spend a lot more money on libraries. Sometimes, children are able to obtain great educations from libraries. Submitted by JohnR on Tue, 01/27/2009 - 18:38.
more the point business contribution SHOULD match education tax. more so than social security as it is funded. who benefits from education, obviously the pupil, but business does thru a more educated workforce, better consumers and decrease in poverty. perhaps a split in funding or lower rates. as to infrastructure being funded on an investment scenario, business would benefit. better ports, more efficient movement of goods, and lastly a return of invested taxes thru the wealth fund investing directly in business development. consider if you live on the west coast and somebody thinks its a great idea to connect power grids from the mid-west to the east coast. west coast doesn't benefit so politics has to convince its a good idea thru the tax and spend model. but if there are fees associated with the building of the lines that return to the fund profits that are then distributed to west coast citizens whats the problem? everything would be considered on a profit potential for development. Submitted by TE on Tue, 01/27/2009 - 11:39. Thanks for the great article! I'm a native Washingtonian that just returned back here after four years in New York City. I think your points are spot on. D.C. has grown and continue to grow into its role as the intellectual capital of the world. I am amazed how the city has transformed, just in the last ten years. While our arts and dining scene still can't compare to our northern New York neighbors, we do live in a city where power is determined by brains and not a checkbook. Thanks again, and when does your book come out? Submitted by Joel Kotkin on Wed, 01/28/2009 - 11:49. Submitted by Joel Kotkin on Wed, 01/28/2009 - 11:48.